Today’s Bluetooth-equipped cars handle hands-free phone calls pretty seamlessly, but things were a little different back in 1988. This is how Nissan managed the setup. This is what you saw if you were in a fully-optioned Nissan Cedric, Gloria or Cima (they were all variations of the same design) sold outside the United States. You got a built-in car phone in the center console where you’d otherwise store your, uh, what did people used to put in their center consoles? Trash? Who knows. Anyway, you got a phone in there, and you could control the phone using this built-in keypad right on the steering wheel. The way it worked was that the center part of the steering wheel was fixed, while the rest of the wheel moved freely behind it. There’s very little information around the internet about this car phone, but it’s clear that the thing was made by NEC, which a player in the early mobile phone market at the time. These phones were four-figure investments, as Fortune reported. 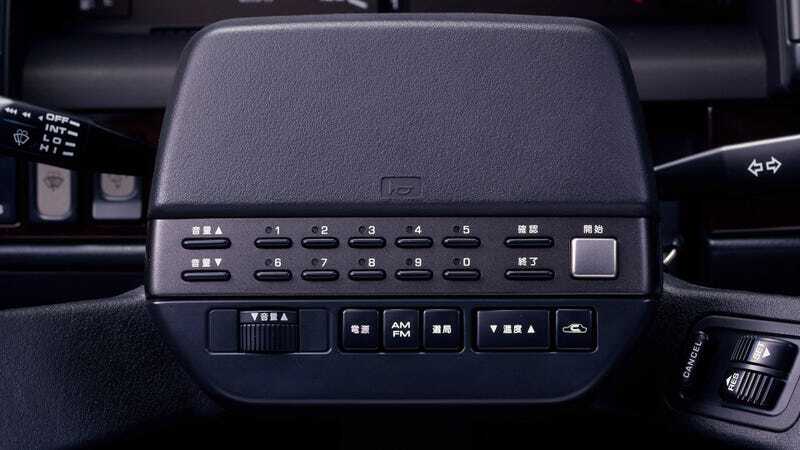 Nissan had started putting optional built-in car phones in their cars a generation before this, with the mid-’80s Cedric/Gloria/Cima. It was around this time that the car phone really took off. You could get a similar but more aftermarket system on a Ford at the time, for instance. It made sense that thing all started going off in the mid ‘80s as Motorola had just brought out the first popular mobile phone. Car phones, as a technology, had been around for decades, but in much more rudimentary forms. Now that mobile phones are no longer so bulky that cocooning them in a full automobile doesn’t make much sense, we no longer have a need for a built-in car phone system. That’s fine, but I’ll miss these buttons.